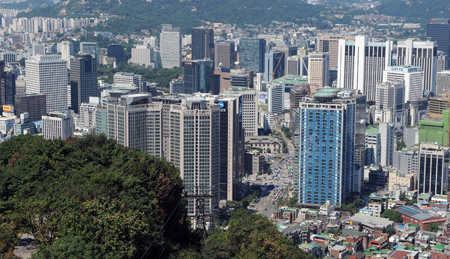 Office vacancies in Seoul will probably remain high this year due to weakened demand for space from companies as South Korea’s economic growth slows, according to Savills Plc. The average vacancy rate of prime offices in Seoul soared to 14.1 percent at the end of September, compared with 12.5 percent at the end of 2013 and 8.1 percent in 2012, data from the real estate services provider showed. The vacancy rate in Seoul’s central business district was 15.7 percent, while the city’s Gangnam district — made famous by singer Psy’s viral hit “Gangnam Style” — had a vacancy rate of 10.4 percent. The Bank of Korea lowered its 2015 economic growth forecast to 2.7 percent last month and reduced its inflation estimate while holding the key interest rate unchanged at a record low. The creditworthiness of South Korean companies is worsening at the fastest pace in at least a decade as the export-led economy falters. Overseas shipments fell 15.8 percent last month from a year earlier, the most since 2009. The office vacancy rate in Yeouido, home of the stock exchange and known locally as Korea’s Wall Street, was 16.5 percent. The price per square foot for office space in Seoul has fallen 0.2 percent this year to $434.7 as of the end of September, Real Capital Analytics Inc. data show. The capitalization rate, or yield on investment, in the city was little changed from December at 5.42 percent, versus the 2.02 percent yield on five-year government bonds.